I Lied to You. I’m Sorry. I know, I know. I said last week that I was taking a break from quilting. But I didn’t really feel like working on anything else, so I started pulling fabric for another quilt. 1. Please use guy colors. 2. Make it big enough so that my feet don’t stick out. Got it! I said. I’m using Elizabeth Hartman’s Rapid City pattern from her book Modern Patchwork. I snagged a fat quarter bundle of Caroline Friedlander’s Architextures from Lark Cottons. I like this line a lot. I recently used one of the ledger prints in my Super Tote. There are grids and text and cross hatches and cogs and contour lines from maps. Its the map print, really, that got me. Those contour lines remind me of map reading during Plebe Intercession and the Land Navigation course at Camp Buckner. Damn night Land Nav. I don’t think I’d ever cursed as much as I did that night. Running into trees, falling off rocks. Hhhm. Maybe I shouldn’t use this print. Many bad memories. All bad cadet field training memories aside, this quilt should turn out pretty rad. Most of the prints are subtle and low volume – meaning fabrics that are light in color and low contrast. I’m using Kona White for the background and Kona Grass for some contrast and a bit of color. 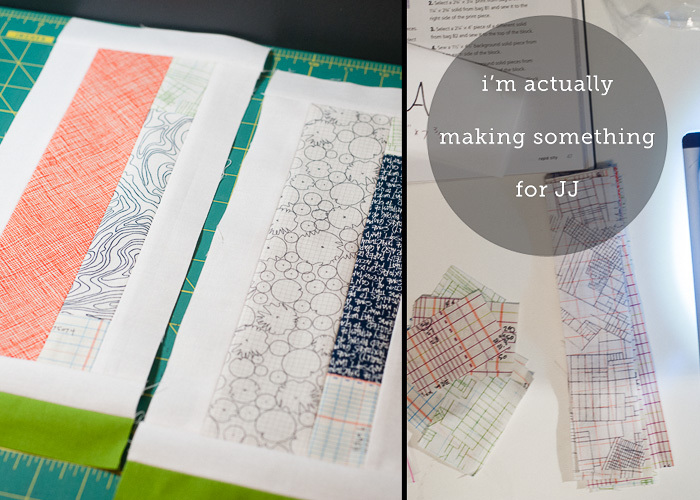 I spent Sunday slicing fabric and organizing pieces into ziploc baggies per the book. I’ve done a little work piecing them together and see where we end up. I know JJ will like it, and I know he will use it. And if he doesn’t, well, then, it’ll be the last thing I ever make for him! Thanks! The more I stitch these blocks up, the more I like them.